What is Eduroam and how do I use it? Eduroam is a global wireless network access service that allows members of participating institutions to connect to wireless networks at universities, research labs, libraries and schools worldwide. 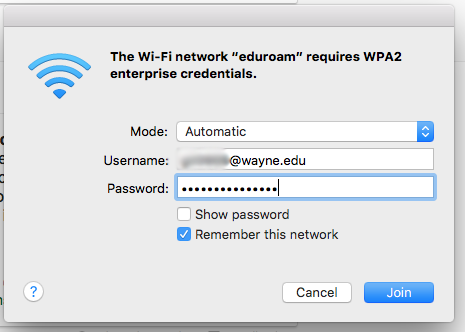 Using eduroam, Wayne State University faculty, staff and students may access wireless networks at different institutions using their WSU credentials. Similarly, campus visitors from other educational institutions that participate in eduroam may connect to WSU-SECURE using eduroam and their own institutional credentials anywhere eduroam is available on campus. 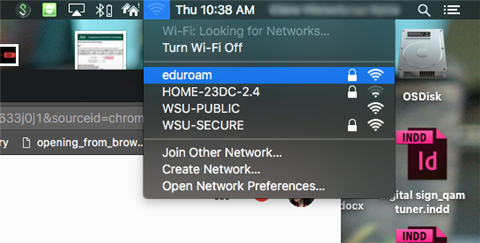 Accessing eduroam is just like connecting to WSU-Secure. Follow the steps below to use eduroam on a computer, iOS or Android device. 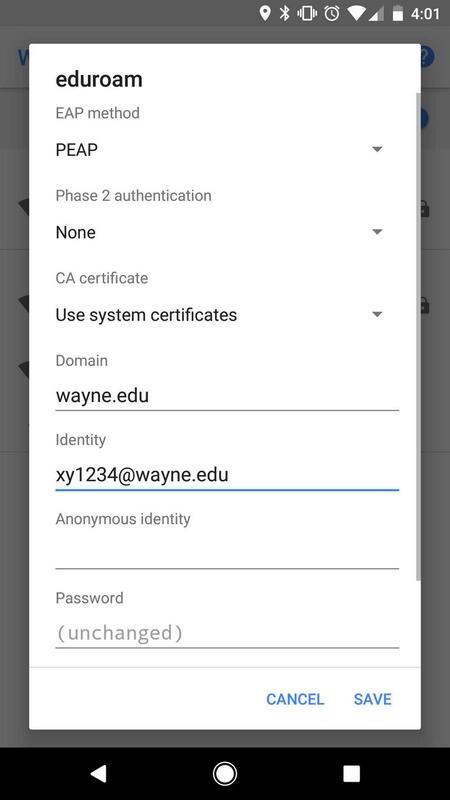 Log in with your AccessID username and password (using your full AccessID@wayne.edu username) and join the network. If you are visiting WSU, log in using your institutional credentials here. 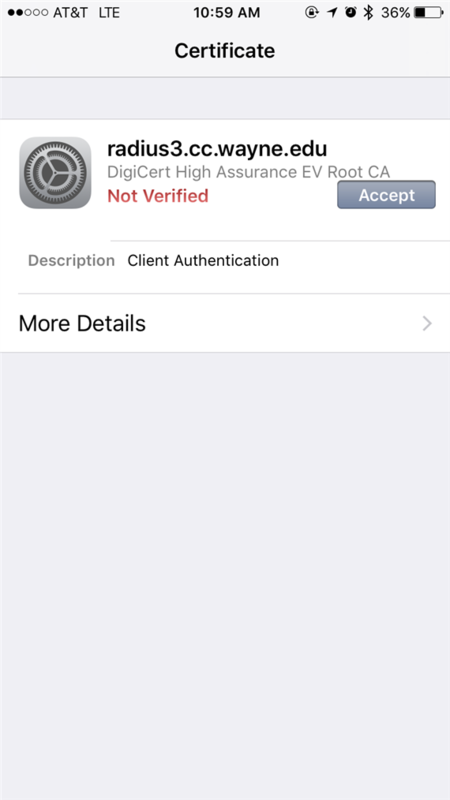 You may have to accept a security certificate to connect. Click Accept. Follow the same steps you would for iOS if you are trying to connect to eduroam using an Android device. Android users may need to provide additional information to connect to the network (see below). Differences may appear between different phone manufacturers. The below examples were taken on a Samsung Galaxy Note5 and Google Pixel. Choose PEAP under EAP method. Choose MSCHAPV2 under Phase 2 authentication. Choose Use system certificates under CA certificate. Use your AccessID in the format accessid@wayne.edu under Identity. Follow the steps below to connect to eduroam on a computer. Click the Wi-Fi button on your menu bar. If you are using macOS, this will be across the top of your screen. If you are using Windows, it will be across the bottom. Any available network within range will appear. Click eduroam to connect. 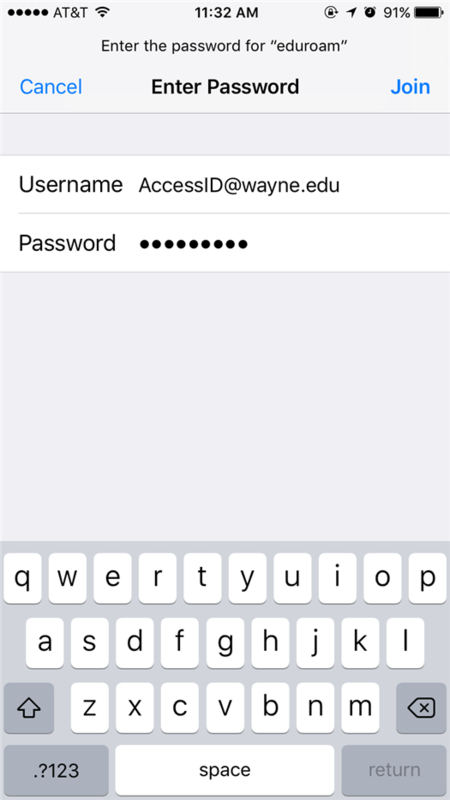 Log in with your AccessID@wayne.edu account and password. Can I use the WSU VPN with eduroam? You may use the VPN once you connect to eduroam at other universities if you would like to add additional security protections, although it is not necessary. 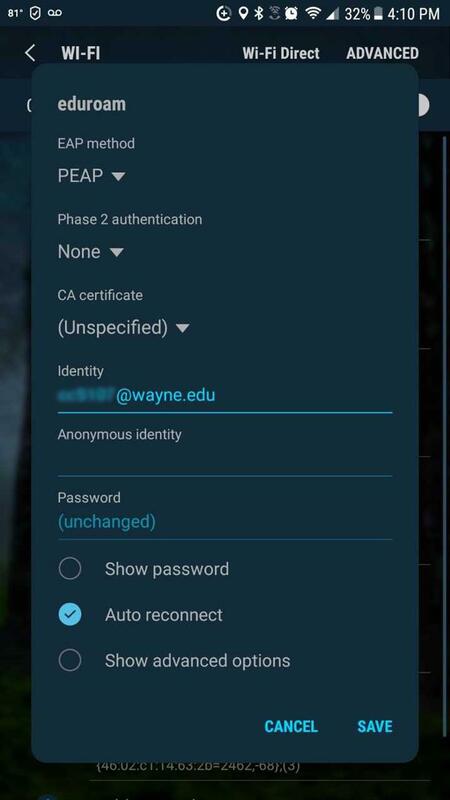 Select Wayne State enterprise applications are only available via the VPN if you are not connected to Wayne State's network. Learn more about eduroam at eduroam.us or eduroam.org. Discover eduroam availability across the globe at eduroam.org/where. Find a list of all included institutions within the U.S. at eduroam.us/institutions_list. If you have questions or require assistance using eduroam off campus, please contact the C&IT Help Desk at 313-577-4357 or helpdesk@wayne.edu. NOTE: Your credentials will never be shared with partner institutions.